I just mentioned fselect the other day, but it’s only by coincidence (and the fickle hand of Fate, as conveyed through ls vimwiki/ | shuf -n1) that I have iselect today. iselect has all the hallmarks of fselect and other line selection tools, but seems to be conscious of its role as an intermediary. That’s a kind of oddball thing to say, so let me explain. Invariably, the curses-based selection tools that we’ve seen over the past couple of years all share the same idea: Accept a list or line of options, present them as a menu, and then return the result when cued. All the way back through fselect and sentaku and slmenu, that’s been the idea. iselect does that, but can torque that idea just slightly, to allow for some other information to pass through. For example, add the -K flag, and not only will you get the selection sent through STDOUT, but you’ll get the keypress your human used to designate it. iselect will also allow multiple selections — done with the spacebar — or force single-selections. It can accept zero- or one-item lists, and allow your human to wander through that seemingly empty exercise, and come up with a selection. Or it can do the opposite, and exit as soon as it detects an empty list, and not waste anyone’s time. Look at the help flags for iselect if you want those or other options; the version installed through AUR does not include a man page, but if you’ve used other selection tools in the past, you’ll have no trouble navigating it. 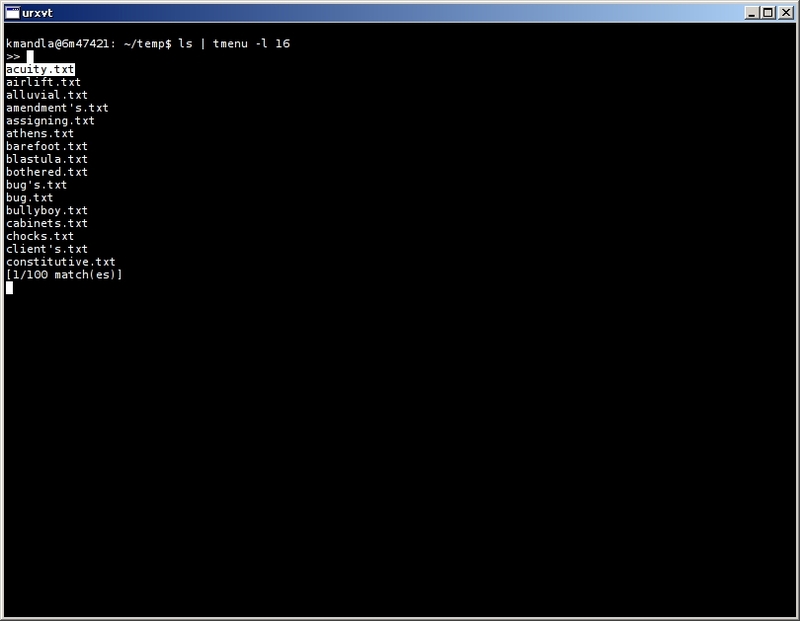 iselect is in Debian-based distros as well. I don’t spend enough time with selection tools like this to know if there’s one god-given tool that everyone relies on in their projects and adventures. For what I’ve seen of iselect though, if I was using a selection interface in my program, I think I’d go with this one. It seems to know why it’s there, and what its purpose is. This entry was posted in Linux and tagged menu, prompt, select, selection, text on 2015/01/11 by K.Mandla. I missed a day yesterday because of holiday travel issues, but I’m prepared to make amends with fselect. As you can see, fselect allows you to select a file out of a list, and will return that to STDOUT as the results of its interaction. For what I could see, fselect only accepted file names in the same fashion as you might get from ls; in other words, I couldn’t cat a list of words to fselect and pick from them, like you might see in slmenu, sentaku, fzf or other file/text selectors. fselect has some internal controls that you will want to know before you use it. Pressing Enter or Esc exits the program, but if you haven’t selected a file (or more) with the spacebar, you’ll get nothing from STDOUT. If you’re just after one particular file, the dot key is a one-button combination of space-and-Enter, and sends your selection onward. That’s how something like vim $(fselect textfiles/*) is possible, as a quick-and-clean file selector. fselect itself takes a few flags, perhaps most interesting being the -y command, which steps through the list of files one by one, and asks if you wish to select it. If you’re in a severely restricted environment or need to think hard on each choice, this may be a useful option to you. I should note that it’s also possible to select directories with fselect, but I don’t believe there’s a provision for moving through directories. Please correct me if I’m wrong on that. Just about the only suggestions I would offer would be color (which Theodore mentioned as a future development) and perhaps the option to use narrower file listings, rather than a full width listing in the manner of ls -lha. In an 80×24 terminal, depending on the width of the preliminary data, it was possible to cut off the file names from the right side of the display, making it difficult to see what you’re picking. This entry was posted in Linux and tagged file, menu, prompt, selector on 2015/01/06 by K.Mandla. 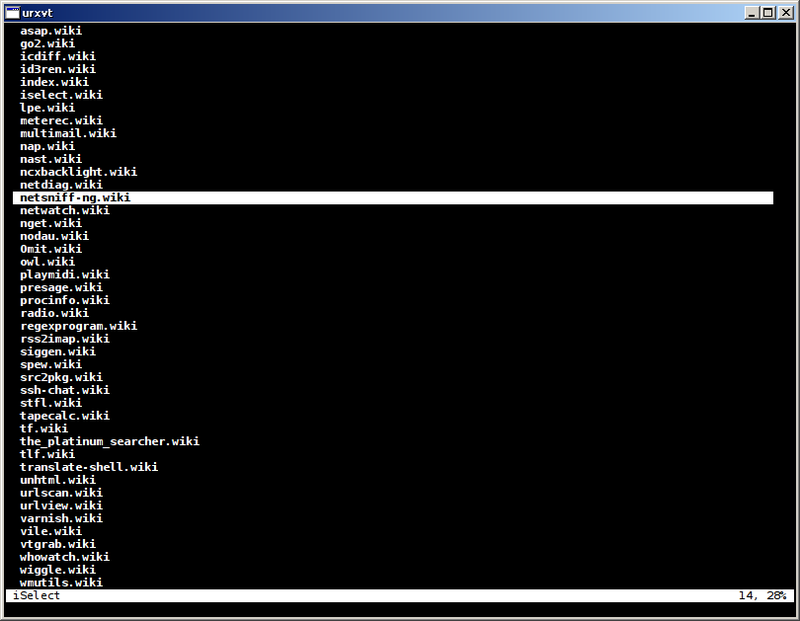 tmenu works a lot like sentaku or percol, accepting piped-in lists and returning to the screen. 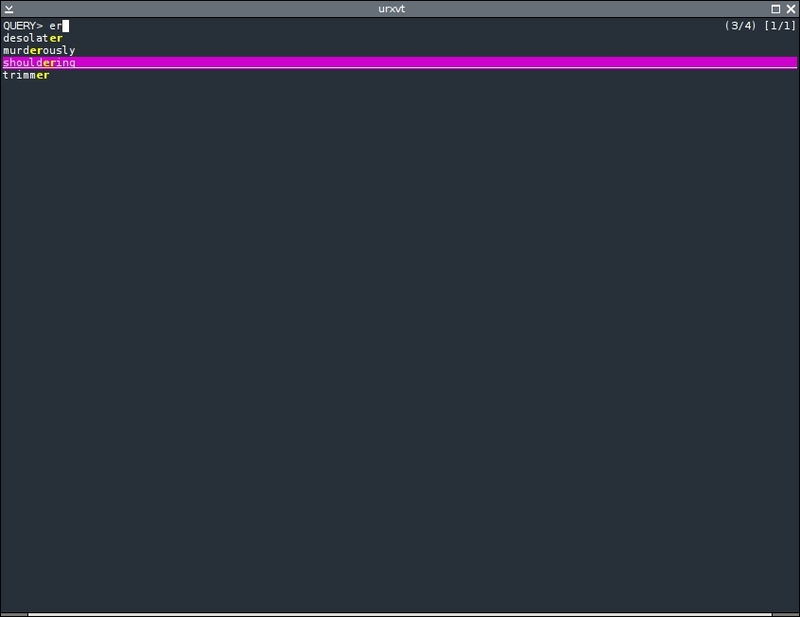 Unlike fzf, tmenu does not assume you want the current list of files, so you have to provide something; just entering tmenu gives you an empty list and a rather pointless tmenu experience. With a proper list, you have the option to filter by character string, or navigate with CTRL+N, CTRL+P and so forth. Press return, and your selection is returned to STDOUT. 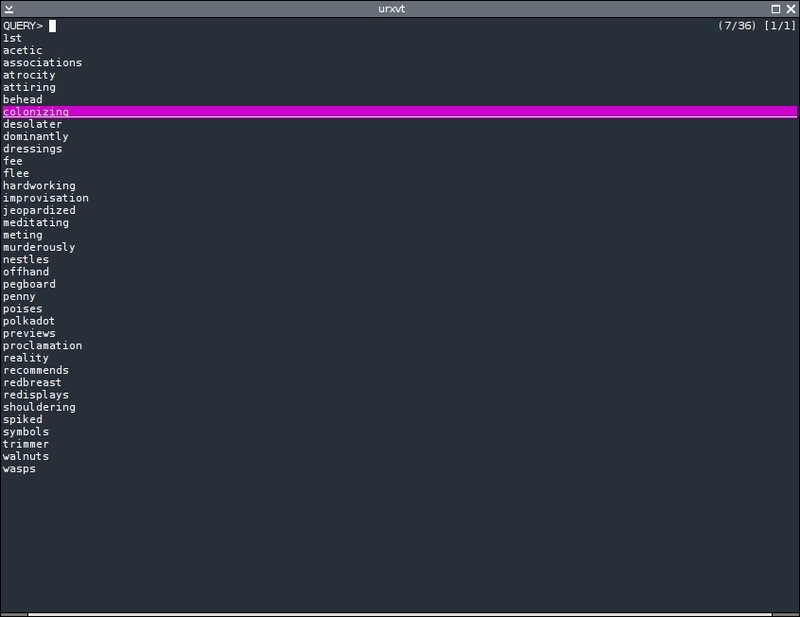 So this too can function in the same way as the slmenu gimmick, without the color that percol offers, without the vertical arrangment that fzf has, and perhaps a little more space-conscious than sentaku. tmenu takes three flags — one for the number of items in the displayed list, one to change the prompt and one to take out the status line. That’s it. Very simple. About the only thing I don’t like about tmenu is the lack of arrow key controls for list navigation. I know that’s fairly minor, but my instinct is to jump for the arrow keys when I’m presented with a list. CTRL+N and CTRL+P make sense when I think about them, but there’s always that split second when I don’t think, and just start tapping fruitlessly at the arrow keys. Grr. This entry was posted in Uncategorized and tagged find, menu, prompt, search, text on 2014/09/08 by K.Mandla. I said a long time ago that find is one of the greatest creations for computers, probably since the invention of electricity. Junegunn Choi’s fzf might make you think hard about it though. In much the same vein as sentaku and percol, fzf accepts a list — by default, the list of files in the current directory tree — and allows selection by way of fuzzy finding. As you can see there, not only does fzf pluck out entries that contain “an” exactly, but also retains options for longer, less-strict matches. Making a selection returns the value to STDOUT, making fzf another candidate for the oft-mentioned slmenu gimmick. Again, though, like percol, you might have to arrange that list of programs as a text file. fzf is a lot less visual than percol or sentaku, but approaches the concept — picking out a selection from a large list — from a pattern matching perspective. 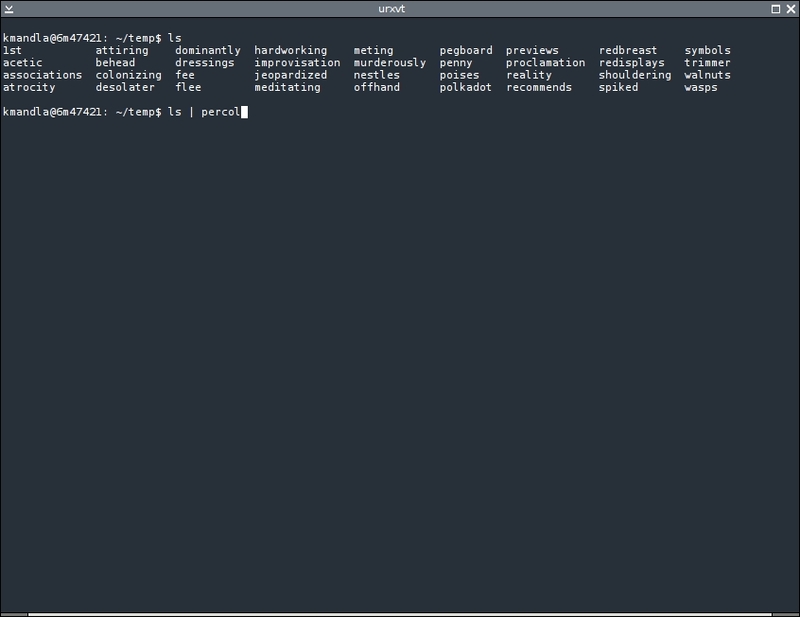 It would take a little more command-line prowess to make percol act in the same way. is viable. 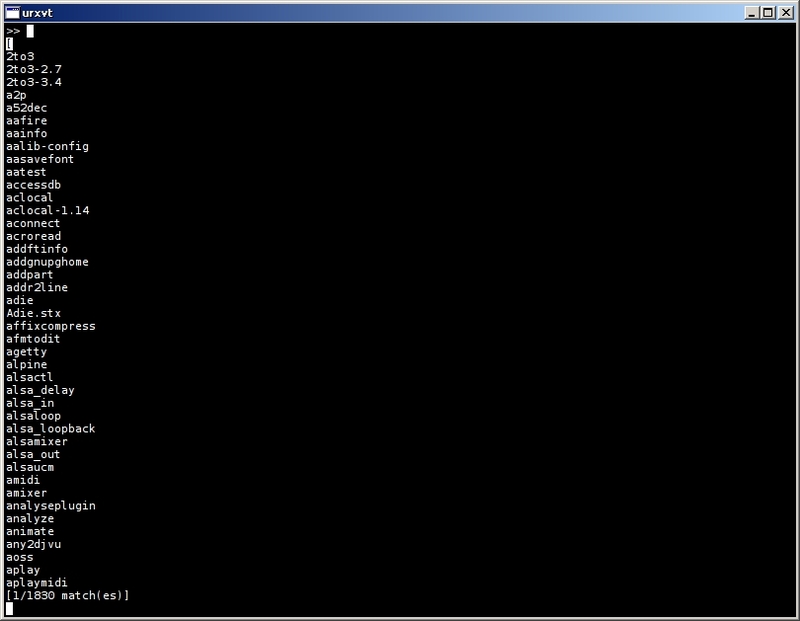 (I should probably mention that I tried to shunt the results of find into fzf, but there were some snags.) It might also play nicely with something that cues music files. Think about that one for a little bit. 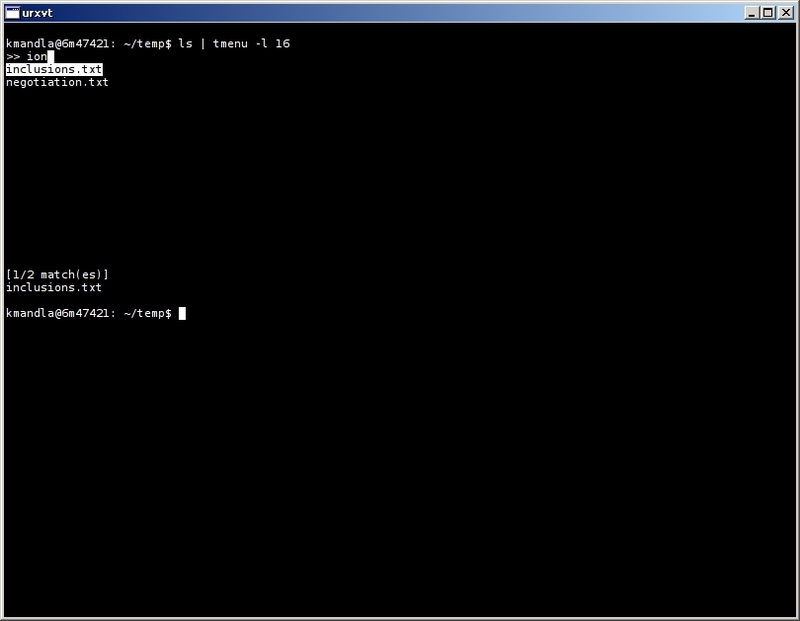 This entry was posted in Linux and tagged find, menu, prompt, search, text on 2014/08/05 by K.Mandla. I thought I was being clever a year ago because I strung together slmenu and a few other random gimmicks, and came up with something like dmenu for text-only environments. sentaku has that beat by a mile. pipe text into sentaku, and it makes a full-screen pick-and-choose application from it. It’s complete with highlighted selection, vi-like or arrow-key navigation, help cues on-screen and best of all, a speedy response time. 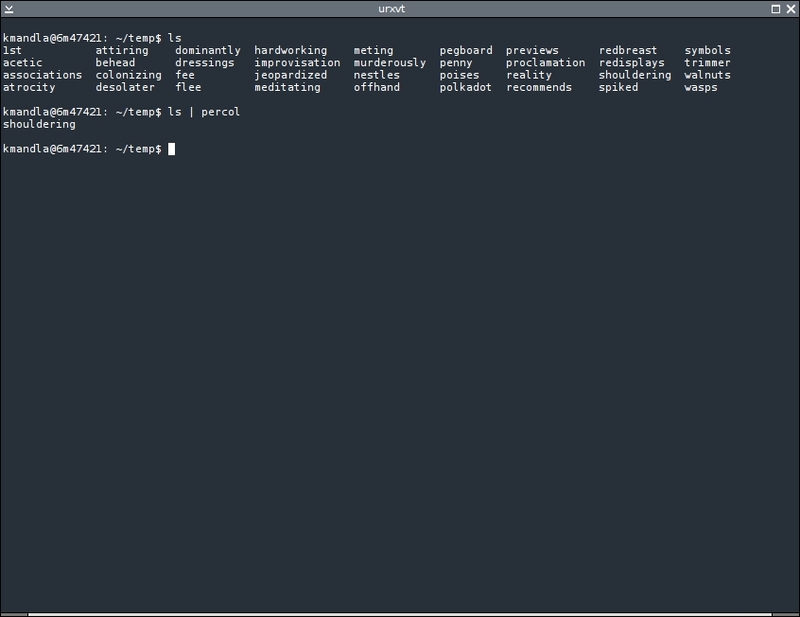 Does more or less the same thing as what I was doing with slmenu. Of course, mine had one-key popup menu access, and snazzy animated gifs. 🙄 But the same could be done with sentaku, with a little effort. 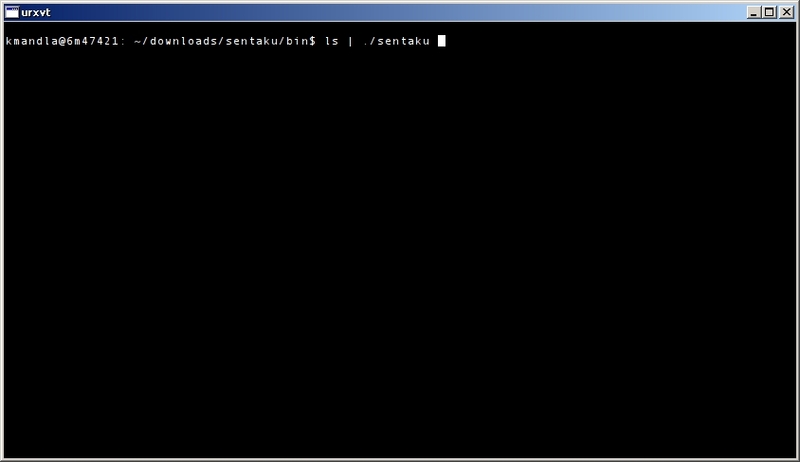 In case you’re thinking this must take a masterful command of assembly language to accomplish, it turns out that sentaku is just a bash script (or zsh, if you prefer). And of course sentaku can be used for other things too. It’s not tied to menu selection, although that was what came to mind first. 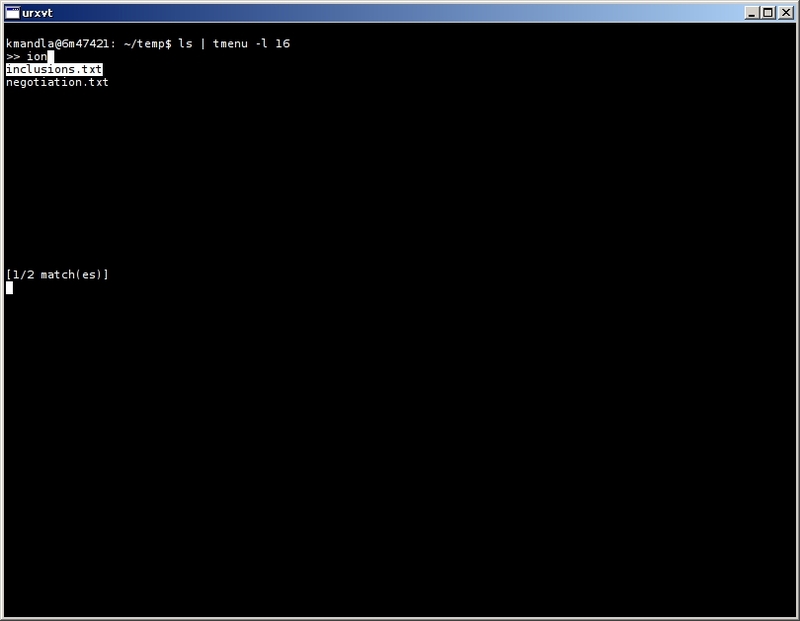 This entry was posted in Linux and tagged menu, prompt, text on 2014/04/22 by K.Mandla. Most of the console fanatics I know would sooner chop off all ten of their digits one-by-one with a rusty grapefruit spoon than surrender their blinky blinky cursor to something like pdmenu. But pdmenu is really quite nifty, and if I may be so bold, no less supergeekcool than the slmenu gimmick I foisted upon the world last year. Multicolor, full-screen, customizable, hooks itself neatly into Debian’s menu tool, has sane controls and defaults … what’s not to like? No more elitist machine-gunner hunt-and-peck console gurus while pdmenu is around. 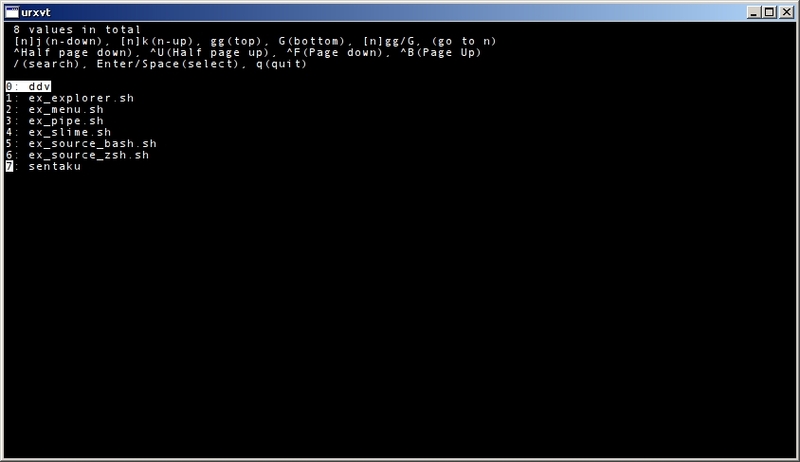 No more grand bearded Linux wizards, if triggering the application du jour is as easy as down-arrow-down-arrow-return. The knuckles will atrophy! We all need our little spheres of control, I guess. pdmenu will take you about a minute and a half to configure with the tools you prefer for text-only applications. If you can configure something like Openbox or IceWM, you can definitely handle pdmenu. And best of all, you can whip the throne out from under your local condescending Unix computer genius. Here’s a nickel, kid. Get yourself a better computer. 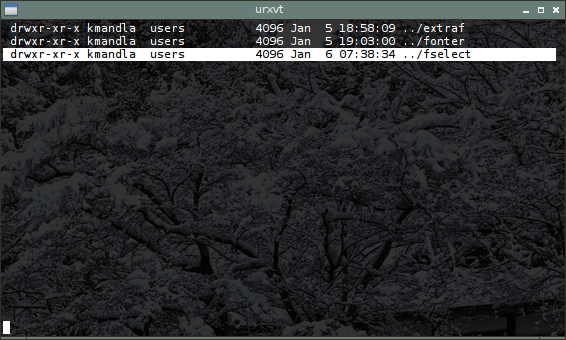 This entry was posted in Linux and tagged custom, keyboard, menu, prompt on 2014/02/26 by K.Mandla.